On Monday, March 19, Hofstra Law honored eight alumni judges for their exemplary service and celebrated its more than 140 alumni members of the judiciary at its first Distinguished Alumni on the Bench reception. Proceeds from the event, which was held at the Hofstra University Club, support a new Judicial Alumni Scholarship fund to benefit current and future Hofstra Law students. 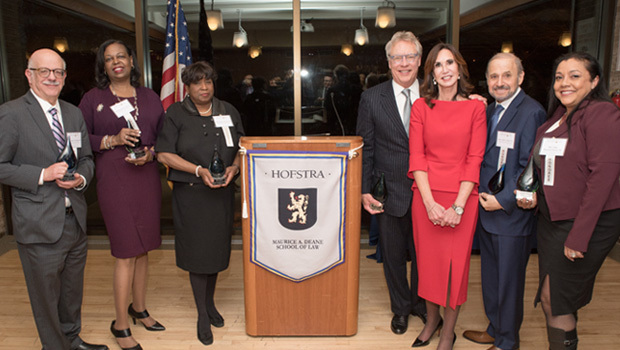 The eight honorees were nominated by their peers, and the event was organized with Hofstra Law’s Alumni Judges of Distinction Executive Committee. For more information, including a full list of Hofstra Law alumni judges, and to view the Distinguished Alumni on the Bench Journal and event photos, visit law.hofstra.edu/OnTheBench.